This might very well be the busiest year of the Atlantic hurricane season, and with two months left the Americas shudder at the thought of what next, who’s next, and when. Three major hurricanes—Harvey, Irma, and most recently Maria—all made landfall roughly one week apart, and caused widespread devastation across several U.S. cities and total obliteration in some Caribbean islands. One of those Caribbean islands gathering the fragments and trying to return to some semblance of life is the unincorporated U.S. territory of Puerto Rico. As of September 27, 2017, Puerto Rico remained in a state of emergency as one hundred percent of the island remains void of grid-based power. This lack of electr icity has already 1) affected the pumping stations—leaving 44 percent of the population without drinking water, 2) inhibited the wastewater treatment process—resulting in prolonged sewage releases and, 3) obstructed the telecommunication systems which are vital for government officials to perform much needed, robust damage assessments. According to Puerto Rican Governor Ricardo Rosselló, it could be months before the island regains full electrification. To those unaffected, it is hard to imagine your home, let alone an entire island going dark—not like a traditional minute or hour long blackout, but rather a darkness that extends several months. Appliances, telecommunication networks, internet access, and banking services are shut down, fuel availability dwindles, and food preservation, medical facilities, and water supplies become compromised. As an island, Puerto Rico’s unique geography makes it very susceptible the direct impact of tropical cyclones, yet there have been few strides toward improving the level of resilience of the island’s infrastructure, especially that of the fragile grid. 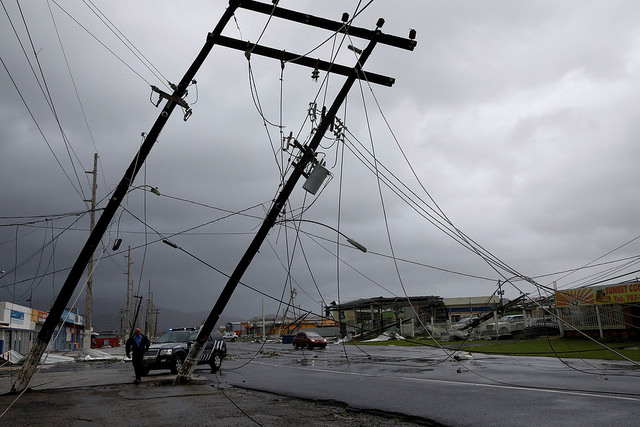 Hurricane Maria, simply put, delivered a knockout blow to an already bankrupt utility company—Puerto Rico Electric Power Authority (PREPA)—by damaging 80 percent of the grid’s transmission and 100 percent of its distribution infrastructure. Already unprepared for such a disaster under PREPA’s management, this four-decade-old power network—that uses the most unsustainable fuels at the highest cost—and above ground power lines have had modernization and repair efforts deferred for years due to financial distress; leaving the island susceptible to storms and regular black and brownouts—the new business-as-usual. With the level of devastation currently being experienced, Maria should help build a base case for completely re-imagining the current energy system—into one that incorporates distributed renewable energy resource technologies like microgrids—in an effort to improve the island’s power resiliency during times of emergency. Distributed energy resource technologies (DER) or microgrids have been around for years—traditionally located atop military bases and in universities—and the technology has come a long way in terms of commercial deployment. Microgrids are a smaller version of the larger utility grid and can be powered by batteries, generators or renewable energy harnessed from wind turbines and solar panels. They can also serve as a key support technology for improving energy resiliency. These small-scale energy distribution networks are versatile enough to synchronize with the main grid yet afford owners the flexibility to disconnect from the regional grid and generate energy independently during emergencies—hurricanes, fires, and earthquakes—or when elevated energy demand stresses the distribution system. Back in 2012, as hurricane Sandy slammed into the east coast darkening swaths of the northeastern population for days, microgrids were integral to keeping the lights on for some residents in Maryland, New Jersey, and Manhattan, thereby demonstrating its robustness during times of disaster. Following the example of these communities, other states like Connecticut immediately began deploying a statewide microgrid program to ensure that power is maintained in the event of a blackout or natural disaster. PREPA, therefore, needs to alter the way in which they plan for such disasters because grid resiliency can be a matter of life and death. On the island, diesel generators are promoted as a backup source of power during emergency situations. However, what Maria has demonstrated is that during such crises, diesel reserves could dwindle and generators could become inundated resulting in a complete cessation of services from critical infrastructure assets such as 911 call centers, emergency shelters, hospitals, and telecommunication facilities. Microgrids, especially those powered by renewables, would bridge that gap keeping such critical facilities energized even if the surrounding grid is down. 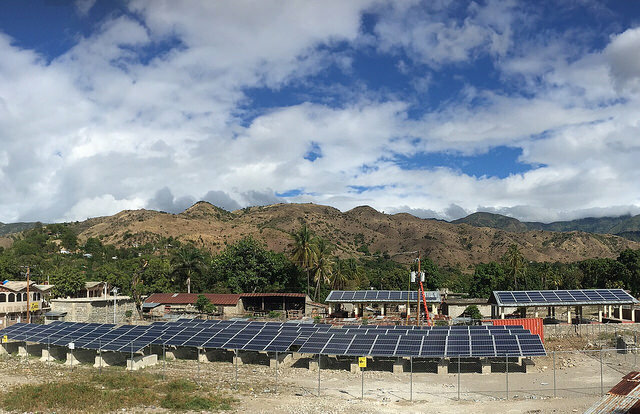 Islands are low hanging fruit for microgrids and with the right enabling factors Puerto Rico would make one of the best locales for deploy ing such technologies capable of functioning continually under natural disaster conditions or fulfilling everyday energy needs. 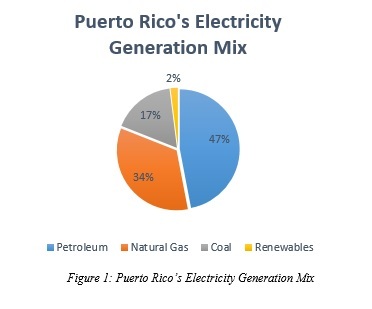 Currently, fossil fuel products drive electricity generation in Puerto Rico and renewable power continues to be an underdeveloped area (Figure 1). The island’s 98 percent reliance on petroleum-based resources makes them subject to supply interruptions, reduced energy security, inflated transport costs, and high retail electricity prices—almost three times the cost per kWh than mainland USA. Island markets—e.g. Necker Island (BVI) just 128 miles from Puerto Rico—therefore lend themselves more readily to distributed renewable energy generation as well as microgrids since their costs relative to traditional fossil fuels are significantly lower. Aside from the import costs of fuel, the smaller size, and population of Puerto Rico compared to the mainland it is harder to achieve th e economies of scale from market interconnections that residents of the contiguous states enjoy. Puerto Rico’s recovery will likely depend heavily on federal aid and on improving the island’s grid, and the latter of will require investments in infrastructure to support distributed energy resource technologies. In the short term, as a form of disaster relief financing, FEMA will be responsible for coordinating efforts to rebuild any infrastructure that was destroyed. However, given the previous state of the island’s power grid, it would be unwise for FEMA to finance any grid-based reconstruction efforts that fail to properly account for environmental risks. Microgrids could offer a solution to this problem, and potentially lessen future disaster costs. For an island like Puerto Rico, microgrids could driving force behind lower costs, better resiliency, and relief for future hurricane victims. Investing in microgrids in Puerto Rico would help in supporting its long-term energy needs. Given the widespread extent of Maria’s destruction, PREPA cannot afford to make the same mistake twice as the island prepares for its long-term reconstruction process. Tags: American Action Forum, Caribbean, distributed energy resources, electricity, Electrification, FEMA, fossil fuels, Generation, hurricane, Hurricane Maria, Island, microgrid, PREPA, Puerto Rico, Renewable energy, Ricardo Rosselló. Bookmark the permalink.